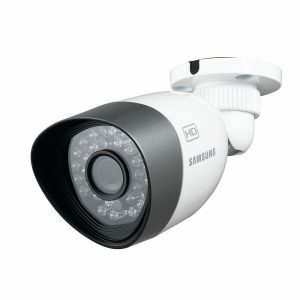 Currently HD CCTV systems are pushing the barriers further away from the low quality 4 camera bundles with poor resoltuion capabilities as this is true of Samsungs 720p (960H) SDH-C5100 bundle, complete with a generous 10 bullet camera set. These weather resistant night vision cameras work at a range of 82 feet at night.They offer remote viewing from any mobile device: Android, apple iphone, iPad, COMPUTER, Mac IP66. This Samsung SDH-C5100 supplies crisp images in 720p HD resolution. This is a complete recording and video capturing and monitoring solution all in one box. This system showcases a 16 channel DVR with a 2TB hard disk. The 10 X 720P HD outdoor bullet cameras are simple to set up and you can monitor them with a free internet application, you can watch your business or house anytime from anywhere in the world, and you can set up motion alerts which contact you when motion is detected. Who needs security personnel? All of the cameras are made to fit well in all environments. With the compact, distinct style, the cams can be put in any kind of place without being discovered. The cameras additionally are rated IP66 ranking meaning they have been tested to survive outside in tough climates and extreme weather fronts. All in all a good weather resistant and versatile discreet HD system, with a lot of cameras, offering you a lot of scope for covering your property. These cameras work seamlessly indoors or outdoors. The DVR uses h.264 compression which will provide excellent quality footage and also save you space on your hard drive. You can schedule recording times, record continuously or record via motion alert technology. All bases are covered.